This is the painting day where some things turn out right and some things get left for another day. Usually rust is not my thing. There are vintage dealers who have entire booths of rusty stuff that I’ll look at, admiring the strong shapes and the complete honesty of the metal, but I’m rarely tempted to bring any of it home. It’s just not my style. There’s something for everyone out there in flea market land, and other lucky people get to love and live with the rusty stuff without any competition from me! But when I spied this rusty antique wire toothpaste & toothbrush holder, my makeover instincts immediately overrode my “Rust? meh” instincts. It’s got some curves, huh? Mr Luray—we’ll call him Blues-Ray—immediately said, “There is no way you are putting that rusty . . . thing in my new bathroom!” Hello, Blues-Ray, it’s my new bathroom too. Fear not, though, I have better plans for this than just a toothbrush holder. 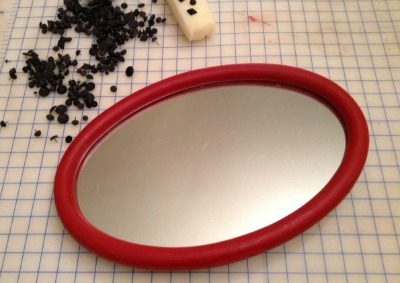 Month of Makeovers Day 2: Start with a clean slate! 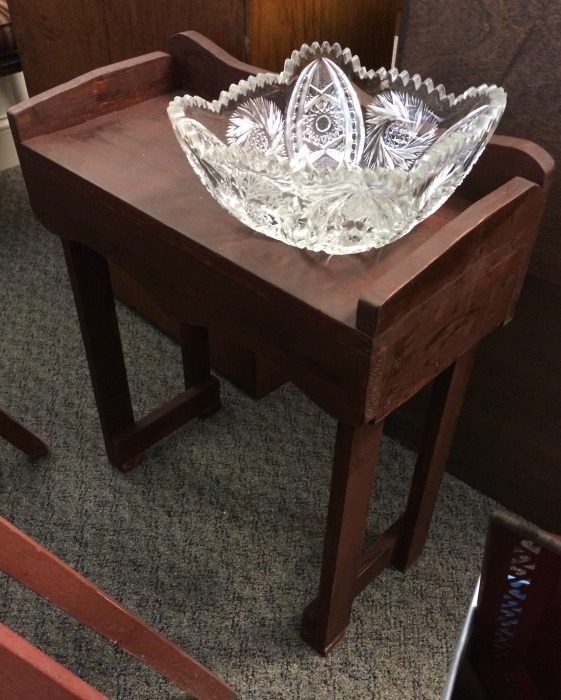 Posted: October 2, 2013 | Author: luray | Filed under: 31 Days, Decor, Makeover | Tags: 31 days, Annie Sloan, chalk paint, crafting, decor, makeover, painting | Comments Off on Month of Makeovers Day 2: Start with a clean slate! 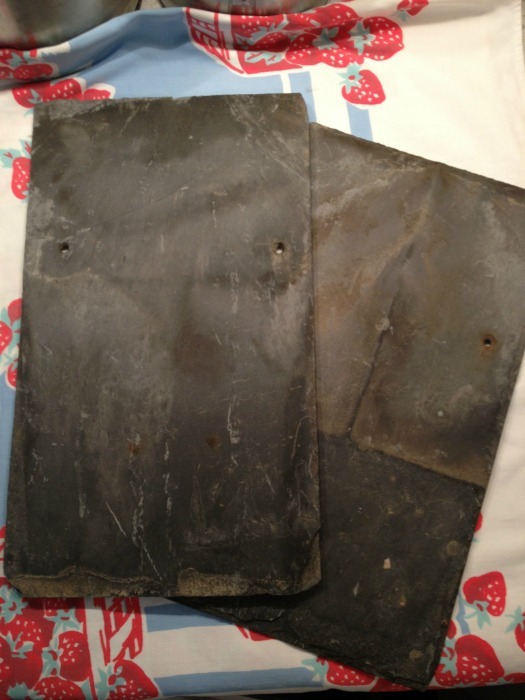 Two weeks ago I scored a stack of antique roofing slates from a renovation down the street. The roofers had shoveled the slates right onto the ground . . . from three stories up. Most of them were smashed. (The slates, that is. Maybe the roofers were smashed, too, who knows? Imagine it: thousands of pieces of fragile, hand-cut stone survive 110 freezing New England winters and then a couple guys take turns throwing them on the ground. Luray pulling her curly hair out>) I picked through the trash piles a bit and pulled out a few that, amazingly, had made it down intact. and started them off with a bubble bath. 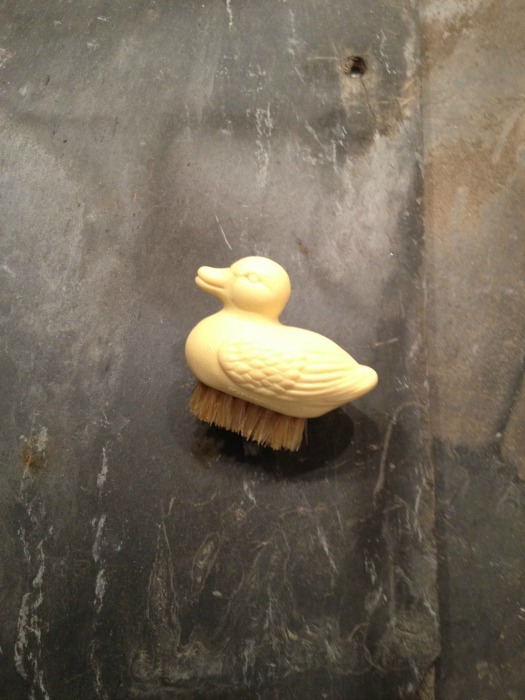 Just kidding about the yellow ducky. I used a real scrub brush. And promptly broke the first slate because I scrubbed it while it was propped against the side of the sink. Too much pressure for that skinny slate! The second one was laid flat in the sink for its beauty treatment. No breaks. Yay! Okay, we got ourselves the proverbial clean slate here! Now it’s decision time. 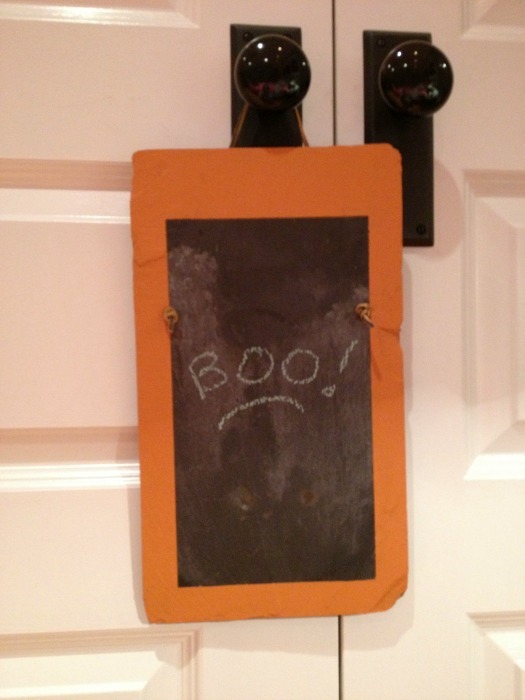 Since I’m using Annie Sloan’s chalk paint, I could paint the entire slate for a completely nontraditional chalkboard. 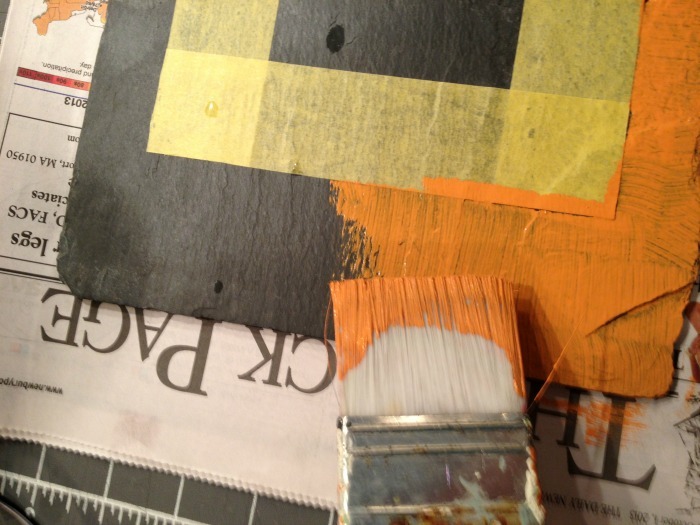 Or I could paint just a rectangle in the center, for a reverse-chalkboard effect. Or I can go with a colorful border. I decide to play it safe and go with the color border. After all, there are 19 other slates to experiment on. Frog Tape, which I’ve never used before, helps mark off the edges. I wonder if it’ll work on the uneven surface of the slate? 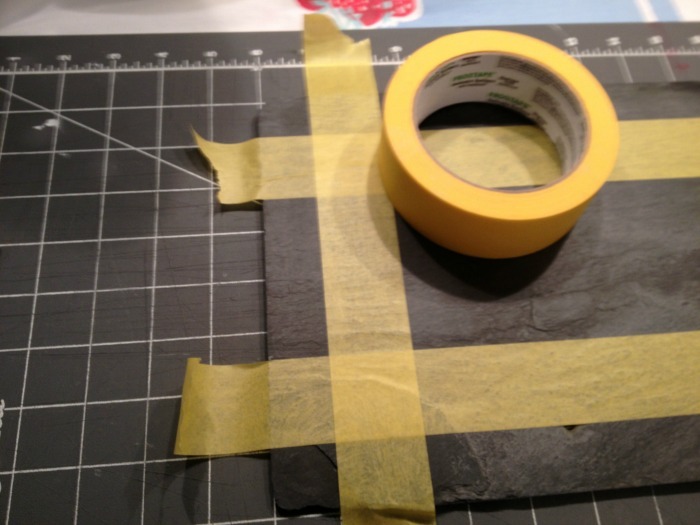 I trim the tape with an X-Acto knife, very carefully to avoid scoring the soft stone. Paint time! I choose Barcelona Orange, a hot color that’ll look awesome in my laundry room. It takes three coats to get an opaque finish on the dark stone. I decide to skip the wax finish. I’d rather see the paint age and chip off a bit over time, just like the slate. So once the paint is dry, off comes the tape. Nice straight edges—the Frog Tape worked! 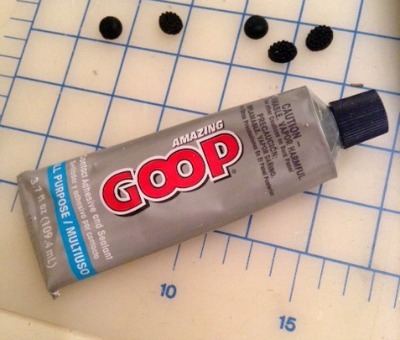 I’m adding this stuff to my bag of Favorite Tools. Then I rummage through my sewing stash for a leather bootlace. A weaver’s knot through each nailing hole and I’m done! Yep, the headline isn’t a typo. 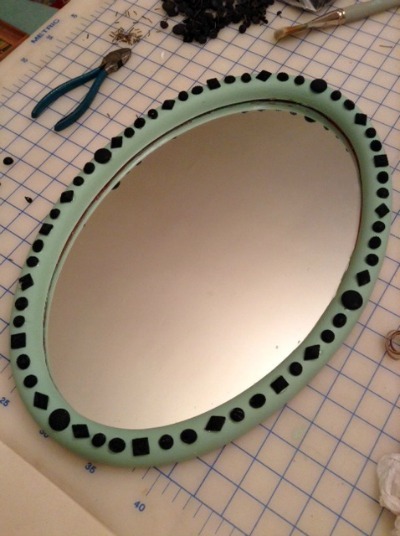 I thought redoing this old mirror would be a quick and easy Day One project to get started on our month of what-have-I-got-myself-into. HA! Joke’s on me. It came home with me this summer after it hung in a dark corner of my parents’ basement for ages. The exposed copper wire on the back didn’t look very classy. It had to go. 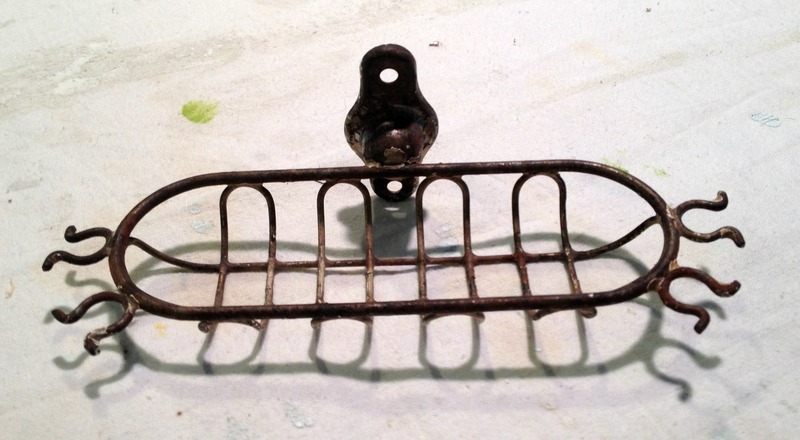 But when I went to remove it both decorative side hooks cracked off. How did hardware with the strength of graham crackers hold up for so many years? 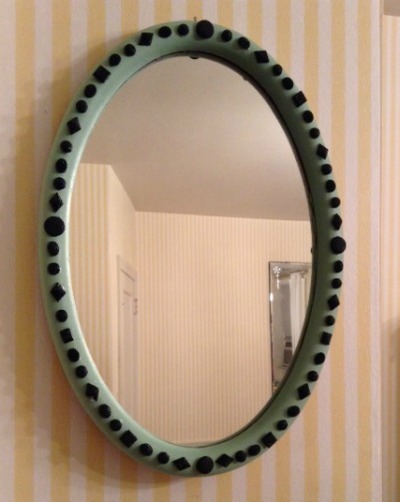 This mirror should’ve fallen off the wall in 1972. Once I removed the broken hardware bits there were two gaping holes in the wood. I plugged them with Elmer’s wood putty. (No photos. Sorry!) 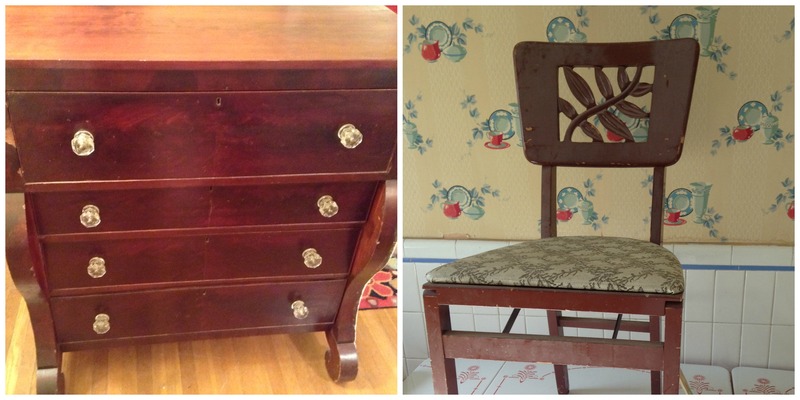 It got a couple coats of Annie Sloan Emperor’s Silk chalk paint finished with a buffed coat of Annie Sloan wax. Then it went to the Vintage Bazaar. Not one person picked it up. Not one! Guess no one likes red as much as I do. Or maybe it just wasn’t a good weekend for mirrors. Or maybe it just needs to have a makeover makeover. This time I decided to go green. I used Annie Sloan chalk paint again because it doesn’t require any prep. No sanding off the wax that’s already on the frame. Cool! 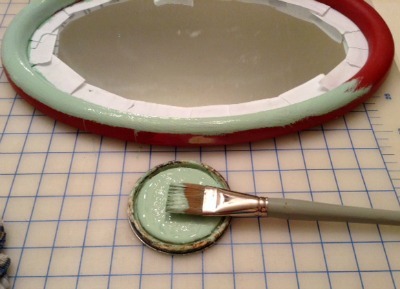 This jadeite green is my own custom mix color. A stockist in NJ graciously and kindly agreed to try to create the color for me more than a year ago. What I got from her was so dark I had to keep mixing it with off white to get a light jadeite green. Once it’s gone, it’s gone. Actually, there’s no reason to use such fancy schmancy paint on a tiny project like this. Craft store acrylic paint in a small, cheap bottle would work every bit as well. I only used the paint on the lid to cover the entire frame with a thick coat. After the paint dried it got another coat of wax. Another thing I claimed from my dad’s former workshop was a jar full of vintage plastic tacks. I assume they were used for upholstery. Who knows? They’re all different sizes and have wonderful textures. They’d be kinda lost on upholstery. 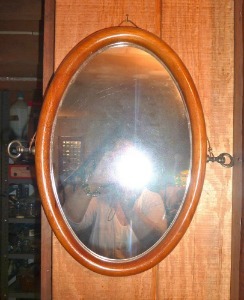 On a mirror you might actually notice their detail. My original plan was to hammer the tacks in, but the wood on this frame is so stinking hard the metal pins bend over without making a dent. Ack! This is not the optimal outcome I envisioned. Instead of a couple minutes of hammering I now have a choice. 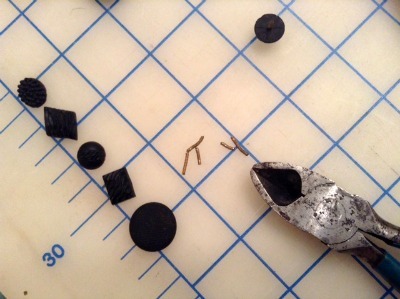 I can drill a hundred tiny holes or snip off the metal pins and glue the little plastic buttons on. Snipping and gluing seems easier than precision drilling, but it totally defeats the purpose of using tacks. 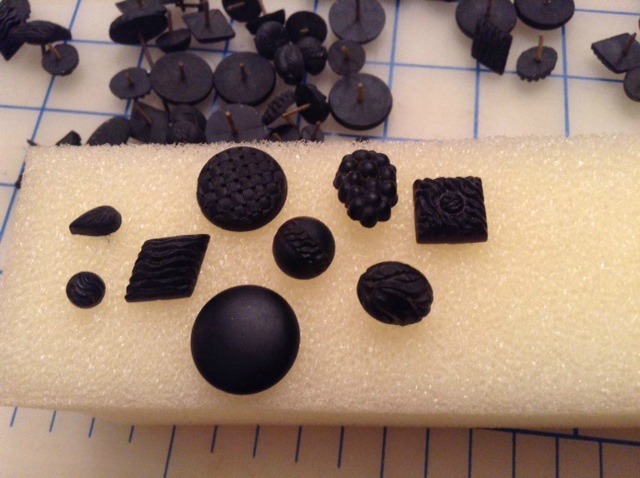 I could have raided my button box or gone to a craft store for some doodads. Sigh. Maybe it’s for the best. Me + hammer + mirror would probably end up with a broken mirror. I get ManRay to find snipper thingies. And I wear glasses so flying bits of metal don’t end up in my eyes. When we get home from dinner I polish the glass and hang the made over makeover mirror on the wall. Not bad. And it’s not midnight yet! Day One done under the wire!